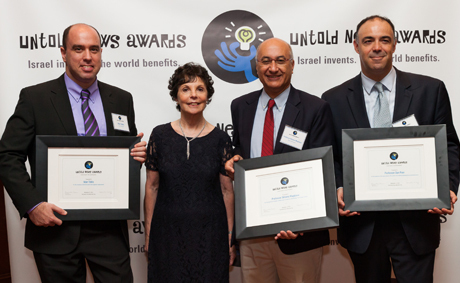 On November 12, 2014, Untold News held the inaugural Untold News Awards event at the Harmonie Club in New York City. Inventors were awarded $10,000 cash prizes for their groundbreaking innovation in technology and science. TV personality Dave Price emceed the ceremony. Inventors went on an express-paid press tour in New York and Boston. Shlomo Magdassi of Hebrew University, who invented flexible, cheaper touch screens for smart phones (bio). Dan Peer of Tel Aviv University, who invented the cancer bullet, a new treatment that kills cancer cells without damaging surrounding tissue (bio). Idan Tobis of Tavor Orthopedic Devices, who invented the first metal knee ligament replacement, which drastically shortens recovery time for this very common injury (article). Inventions were evaluated based on improvement of the human condition, worldwide impact, and feasibility.